If you’re staying in Waikiki on your Oahu vacation, then you’re probably wondering if you need a rental car or not. Let me first say that a rental car is not a necessity. You can get around Oahu with public transportation and packaged tours. That being said, there is a certain degree of freedom and flexibility that a rental car offers that might enhance your visit to Oahu, which might make you consider renting a car. In this article I’ll give you some good food for thought to help you determine if you want to rent a car or not. Before I dive into the details, I want to make you aware of an option you may not have considered. If you are on the fence about renting a car, then consider renting a car for part of your stay. You can find rental car desks right in Waikiki, there may even be one in your hotel. For example, there’s a Hertz desk at the Hilton Hawaiian Village. Enterprise brings rental cars to you. You could potentially rent a car for a single day and return it at the end of the day. Then, the next day rent a car again, if desired/needed. Now let’s look at the upsides and downsides of renting a car. Gives you freedom for getting around to see Oahu, particularly outside of the urban area of Honolulu. Rather than taking a tour bus around the island, you can stop off as many places as your heart desires rather than sticking to a stringent tour schedule. Anytime I’ve been on a tour bus, there are so many times I’d love to stop the bus to take a photo, but the bus continues on. Gives you more privacy as compared to public transportation and tour buses. If you are planning several tours, you might save money by renting a car. For example, if you want to take a family of four on the Circle Island Tour, you may end up paying upwards of $200 where as a daily rental car may cost you only $45 or even less. Gives you a sense of adventure. When I think back to some of my vacations around the world, I often remember the fun and satisfaction in navigating to a special scenic spot. Sometimes the journey is just as good as the destination. Driving in Honolulu is like driving in any other city – there’s busy traffic, one-way streets, multiple lanes, etc. You’ll definitely need a good map and/or a GPS navigation system, and do some route planning before you head out on the road. Navigating can add a bit more stress as compared to just hoping on a tour bus. Parking at your hotel may cost a small fortune. Expect to pay an average price of about $25 per day. This website lists the Waikiki hotel parking fees. In general, parking in Honolulu can be a royal pain in the you know what and your wallet. So, be sure to check out this post on cheap Waikiki parking. Bear in mind, that gas prices are a bit higher in Hawaii as compared to the US mainland. Just from my experience, I’d estimate that gas costs about 10% higher in Hawaii. Using public transport is better for the environment. How might you get around Oahu to see the sights without a rental car? Oahu offers clean, safe bus service with TheBus, which passes at or near many Oahu attractions. To get to/from the airport, you can’t take TheBus unless you packed extremely light. See these rules regarding baggage limitations. Shuttle service and cabs are readily available to and from Honolulu (HNL) airport. Many packaged tours, luaus and excursions provide transportation either as part of the total cost or for a nominal fee. I hope this post has helped you make the decision that’s right for you. If you are wondering what I would do, I’ll tell you. I’d rent a car for at least a day. Using Google Transit to help you navigate Oahu’s bus system. 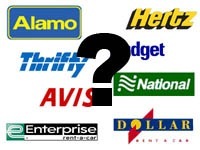 Will you need a rental car on Maui, Kauai, Big Island, etc. If you’ve been to Waikiki before, what did you do? What tips and tricks did you learn? Please share your comments. I’ve been to Oahu with and without a rental car. The rental car is a much better option. The schedules for those tour buses are too rigid and it’s crowded plus sometimes I’m not in the mood for singing songs, getting to know the person next to me and playing driving games. Sometimes I’d like to just look out the window or have a conversation with the person I’m traveling with. The convenience and freedom of the rental car are well worth the extra expense. Plus it’s pretty fun if you get the convertible. Hi Emma – Thanks for your insight. It’s particularly meaningful since you’ve gone with a car and without. I tend to like the privacy, too. I see you’ve done both as well. 🙂 I love your blog. Hawaii is wonderful. I have been to Hawaii many times and in Wakiki Beach you can get around on the city bus or tour companies to areas of interest. I actually learned how to use other bus as well. You could take a bus every day from your hotel to Hilo Hatties a must see candy factory tour and store of everything Hawaiian for those must have souveniors. Steps from this is the Pinapple Factory Tours which I heard have closed. The same bus back to town take to the zoo and they take city bus to Sea Life Park and Haniuma Bay for snorkeling. I have taken the city bus for an all island tour as just something different and can be a long day and suggest a tour company can be best. On company we went on had an itinary but ask each person what they most wanted to see and she incorperated it into the trip is was one of those small bus vans with huge windows I think there were 12 of us and what a great day my thing was the views and beachs and she made many stops for photo ops and everyone loved it. It was my favorite tour of the island and I had been on many. Don’t rule out this experience is is more personal than a huge city bus of people on a tour so go with small micro bus tours. They make it fun. The always go to 2 places for lunch on those tours and the driver asked us if we were game for a local hang out and we all went and it was amazing. I had been to the other two places and this was great. It is where the bus drivers go when they drop you off at the luxury lunch places. We had a show with a seafood feast and beach access for relaxing afterwards. They had everyone interact in the show and I mean everyone I never laughed so much. As a tour they get you to the front of lines when arriving at a event and that was huge. I think also cosidering a vacation rental when in Hawaii is a good option also.